Here we have a bowl of Malaysian Curry Stew from Dao Palate, a vegan restaurant in Prospect Heights, Brooklyn (I don’t live in the neighborhood, but they have a pretty wide delivery area). This dish is made with soy protein, carrots, broccoli and potatoes, and it’s delicious—mildly spicy, really hearty. And they give you enough for leftovers the next day. Other Dao Palate options I can recommend: the Avocado Tartar; Shredded Moo Shu Vegetables; Cilantro Tofu; Pineapple Fried Rice; and Thai Basil Fried Rice are all great, although the fake ham in the latter is very convincing in a way that’s a little gross. 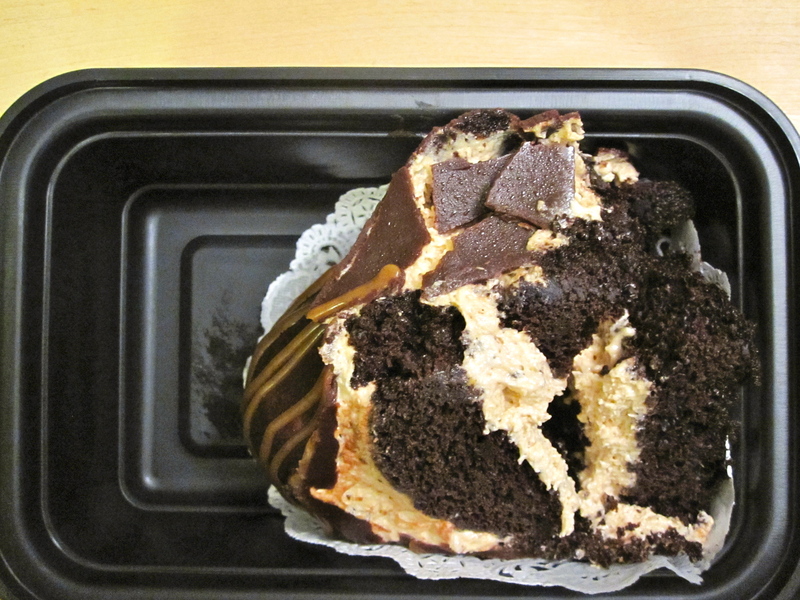 The one thing you have to try is the Peanut Butter Bomb; it’s the most ridiculous vegan treat ever. I mean, look at it! This Moroccan Vegetable Tagine With Couscous* is another recipe from The Purple Carrot (and as with their Three-Bean Burritos, I purchased the ingredients myself rather than pay for one of their meal kits). I stuck to the recipe fairly closely, apart from a moment of madness where I forgot to add the golden raisins that I’d bought especially for this dinner. I also used a different kind of couscous: the recipe specifies “Moroccan couscous,” but my local grocery store only sells Israeli (aka pearled) couscous, which is about three times the size and takes a bit longer to cook. In any case, it didn’t seem to matter—this dish was delicious and very filling, and it lasted the two of us two nights, with leftovers for lunch. If, like me, you hate asparagus, fear not: the tagine has an intense sweet and spicy flavor that completely disguises the foul, foul taste of asparagus, and the asparagus adds a nice crunch (it’s only cooked for a few seconds). If you’re thinking the ingredients list looks a little long, I reckon you could skip the pine nuts and raisins, but you definitely need the prunes, apricots, and assorted spices. So far this is my favorite of the dinners I’ve recorded here. * This link takes you to a cached version of the recipe; The Purple Carrot is redoing their website and they seem to have hidden or deleted the old recipe archive. My apologies for the dearth of dinners! I’ve been diligently photographing my nightly meals, but haven’t had time to post them all; I’ll try to catch up over the next few days. Last Tuesday I made another basic bean tube, pictured above in all its unattractive pre-wrap glory. I diced up an onion and a few garlic cloves, sautéed them in olive oil for a few minutes, then added a tin of black beans (after I’d rinsed them in water to remove that weird foam), a tin of refried beans, and a spice mix of 1 teaspoon chili powder, 1/2 teaspoon cumin, and 1/2 teaspoon garlic powder (i.e. the same mix I used in the Three-Bean Burritos). Once everything was combined and heated through, I served it with some quinoa (you can just see it peeking out from under the bean goop), and topped it all with vegan cheese shreds, salsa, mashed up avocado, and some Just Mayo (a slightly odd addition, but it tasted great and the texture mimics sour cream). Worth noting: if you like to do bulk meal prep at the weekend, you can cook up a heap of quinoa (or rice, if you prefer) and the bean mix and then store them in the fridge (they keep for 4-5 days), ready for assembling into a quick burrito dinner—or you can just combine the quinoa and beans in a bowl, stick a few slices of avocado and some hot sauce on top, and call it a Tex-Mex Surprise. I served the burrito with a side of potatoes (pictured below; Rob and I shared this plate). These were decidedly basic: I just cut up a few potatoes, placed the slices on a baking tray, slathered them with olive oil, salt, pepper, and a few shakes of Italian seasoning, and baked them at 400°F for about 22 minutes, turning them once. (I started off turning each slice with a pair of tongs, realized it was going to take forever, and abandoned that plan in favor of randomly scooping them up with a fish slice, flinging them in the air, and hoping they landed on the other side. Worked fine.) And I served them with more Just Mayo because it’s DELICIOUS. I never really liked regular mayo—there was always something a little icky about the egginess—but I love Just Mayo. And my non-vegan husband is pretty keen on it too; I came home the other day to find he’d been using it as a dip for corn chips (?) and had eaten so much of the stuff that he just about made himself vom. Just Mayo, you are welcome to use this delightful anecdote in your marketing materials.